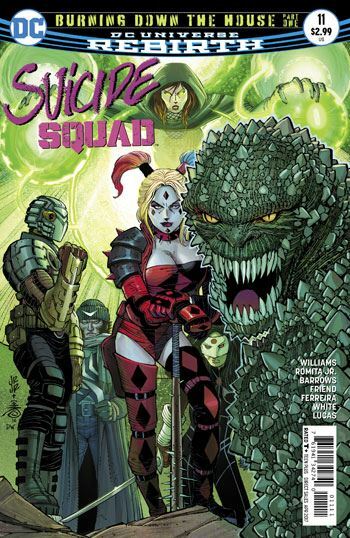 Suicide Squad #11 is a major issue. One I need to avoid discussing in total, or else give a spoiler warning. By this point, that is probably not even needed, but I am going to stick with my usual style and ignore the elephant in the room. 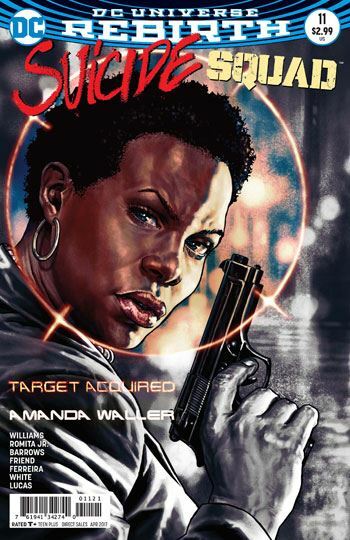 To a degree this story is a sequel to the Justice League vs Suicide Squad miniseries, as Rustam comes hunting for vengeance against Amanda Waller. Waller herself is on leave, while an investigation into her role in the events of the miniseries is completed, leaving Harcourt in charge of the Squad. As is the usual, there are two stories in this issue, although this time they read like two chapters of the same tale. This is a bit jarring, given the dramatically different styles of art. And while Rustam is on the hunt, Harcourt is scheming, and Hack is playing double agent, the other members of the team get some r &r time. This provides a couple of good scenes. Deadshot gets re-united with his daughter. It’s a touching moment, though given the dark fates of Deadshot’s family members in the past, probably not one that is going to end happily. More surprising is Captain Boomerang, partying hard, or trying to. His return from the dead has caused a change in his personality, one that he is not able to control. Try as he might, Boomerang is no longer able to be a crude sleazeball. It’s downright tragic. And then there is the big ending. Something more than meets the eye must be going on, but it’s still a shocker.